In 1909, Tennessee was in a hurry to become a dry state. Refusing to wait for the rest of the country to catch up, Tennessee, moral overachiever that it was, passed Senate Bill No. 11; making it illegal to manufacture and distribute alcohol. Even though Prohibition wouldn’t take effect on a national level for 10 more years, the “Noble Experiment” had taken its first foothold in America. With Tennessee leading the charge towards dryness, it didn’t matter that Charles Nelson’s Green Brier Distillery was the nation’s largest producer and supplier of Tennessee whiskey. Producing 380,000 gallons and a distribution ranging from San Francisco to Paris, it can be argued that Nelson put Tennessee whiskey on the map. But that was not of value to a state seeking sobriety. Indeed, it was Green Brier’s very success that proved to be its downfall. In the face of Senate Bill No. 11, smaller distilleries like Jack Daniels, which produced a mere 6% of Green Brier’s volume, fled Tennessee. Ducking and weaving Prohibition laws, the little guys stayed alive. But Nelson’s Green Brier was much too large to move underground or relocate to a wet state. As a result, the doors of Nelson’s Green Brier Distillery were shuttered and a 100-year slumber began. It was the summer of 2006 when the fate of Nelson’s Green Brier Distillery began to shift. Charles’ great-great-great grandsons, Andy and Charlie Nelson, stood outside of the old distillery, now a tattered vestige of Prohibition. Both recently graduated from Loyola Marymount University, Los Angeles, the Tennessee brothers were home in their native Nashville. Visiting the town of Greenbrier, just 23 miles north, was supposed to be a simple brotherly outing. Maybe it was the babbling spring water creek alongside the now historically registered building. Or maybe it was the voice of the butcher down the road, the one who had pointed them in the direction of the distillery, proclaiming, “That there was your granddaddy’s distillery!”, ringing in their ears. But suddenly and without a doubt, Andy and Charlie knew what they had to do: reignite the Nelson whiskey legacy. There were a few minor challenges, though. One, neither Andy nor Charlie had ever made whiskey. Two, there was very little in the way of recipes. Charles Nelson had created over 30 brands of bourbon and whiskey but had failed to save any to Pinterest. Lastly, neither of the recent grads had the money needed to jumpstart a pre-Prohibition era distillery. The work was certainly cut out for the modern southern gentlemen. Rolling up their sleeves and dusting off what archives were available, hints of Charles’ recipes and the style in which he created whiskey were slowly revealed through old newspaper articles, advertisements, and inventory receipts. A crash course in distilling by a Maker’s Mark Master Distiller taught the brothers the art and science of making world-class booze. All that was left was to raise money and start distilling. 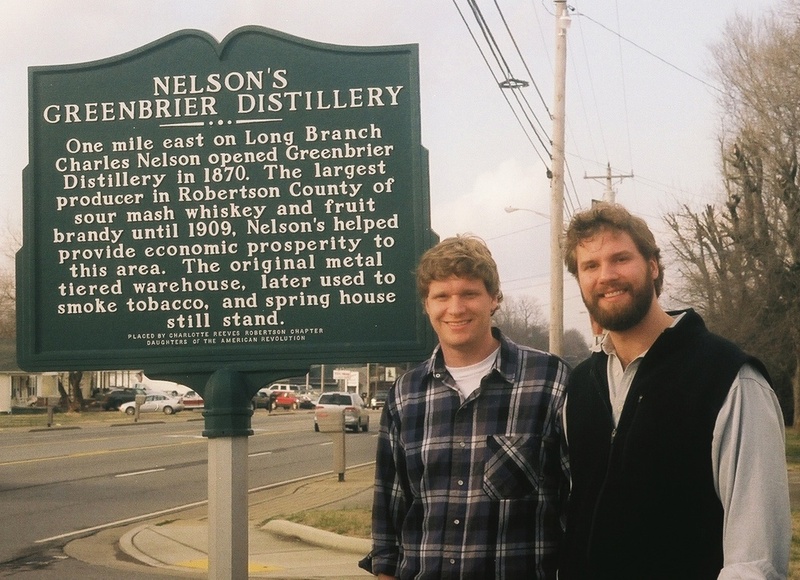 In 2009, three years after the brothers promised that they would bring back Nelson’s Green Brier Distillery and 100 years after Prohibition forced the doors closed, Andy and Charlie put their first bottles of original recipe Tennessee Whiskey and Belle Meade Bourbon on the shelves. The Nelson’s bourbon, known for it’s high rye content and smooth finish, is also offered with a sherry cask finish. Rich and warm with notes of caramel and vanilla, it’s clear that the Nelson boys are just warming up. At this year’s San Francisco World Spirits Competition, Andy and Charlie took home more awards than brands entered. Still fresh on the distilling scene, they are quickly making a name for themselves. There’s no real ending to this story. This is one that will keep going, hopefully for generations to come. Through relentless drive and dedication, Andy and Charlie’s dream has taken root. In 2014, the brothers opened their own distillery in Nashville, creating space for tours, tastings, and for the rich Green Brier history to come to life. Next up is to further increase the number of bourbon and whiskey brands offered - something Andy is particularly excited about. The journey is far from over, but one thing’s for sure: Nelson’s Green Brier Distillery is back, and with Andy and Charlie at the helm, it’s ready to reclaim its throne. This cocktail is named for Old Natchez Road, the home of the Belle Meade Plantation. Think of it like a kicked up Southern Sweet Tea. The cardamom infused tea perfectly compliments the Belle Meade Bourbon, while the lemon juice and ginger beer brighten and lighten the flavors. This is the perfect drink for a hot summer’s night, though a case could easily be made to drink it come winter, too.